Nava Graha includes the sun, the moon, mars, mercury, Jupiter, Venus, Saturn and the two shadow planets Rahu and Ketu constitute the Navagrahas. Basically nine grahas or planets present in our horoscope control our karma and desires. They also channelize outcomes of our Karmas. These nine planets exert an influence in our lives and that influence is called as dasa which can be known from the horoscope of an individual. 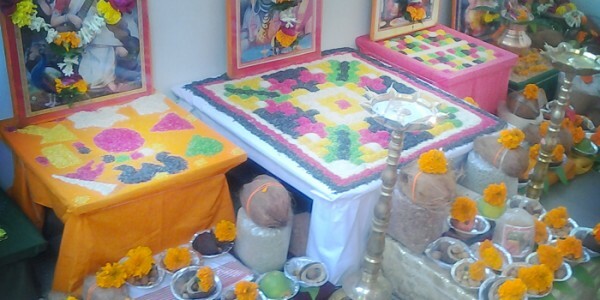 Nava Graha Puja is conducted to reduce the negative effects and improve the positive energies related to a person in the most spiritually effective manner. Nava Graha Puja perfectly provides inner energy and positivity that transcends life towards light from darkness and hence removes all the impediments of success. Improvement in mental and physical health with the help of blessings of all the nine planets. Nava Graha Puja bestows blessings that provide absolute security against all types of malefic forces. Guaranteed Accuracy in Conduction of Nava Graha Puja that showers blessing of all the Nava Grahas in the most apt and fulfilling manner. Transparent conduction of Nava Graha Puja as per the rituals explained in Vedas. Inclusion of Pundits and Purohits who are well aware of Vedic Nava Graha Puja as they are Gurukul trained Purohits and they conduct Nava Graha Puja as per Vedic rules.